Congrats to Sherry Lauser and Kellie Watson for winning this giveaway! Sung Tan Chuk Ha! Which is to say Happy/Merry Christmas! Christmas Around the World with CurrClick has partnered with myself and nine other homeschool bloggers this week. Goodies will be given away during our bloggy event, so be sure to check the schedule and stop by each site to learn about Christmas in other countries, and maybe even make some new friends! You'll find the TWO Korea giveaways at the end of this post. Okay, so it's not quite as big as I remember. The Republic of Korea (South Korea) has roots in Buddhism, so you will not find a Christmas celebration or tree in every house. But Christianity is growing and you will find many Christians (and non-Christians) celebrating Christmas in ways similar to Europe and the United States. South Korea is the only East Asian country to recognize Christmas (Sung Tan Jul) as a national holiday. Kids in Korea LOVE Santa Claus, whom they call Santa Harabuji 산타 할아버지 (Grandfather Santa) or Santa Claus (said with a Korean accent). Unlike the American Santa Claus, Santa Harabuji can be seen in the traditional red suit, as well as a different color-- blue! When friends and family exchange gifts, the most popular gift is MONEY. (Insert cheers from my boys!). For a close friend or relative, it would be more traditional to give a single gift with much thought behind it than to give many gifts. A formal dinner is a favorite way to celebrate the holiday with family members. The menu might include popular Korean dishes such as sweet potato noodles (japchae), rice cake soup (dukguk), barbecued beef (bulgogi), and a variety of kimchi. Caroling parties are a fun activity for young Christians on Christmas Eve. It is traditional to invite carolers in for hot drinks and treats. Here's a cute starts-out-normal version of Jingle Bells that y'all might like. Would you like to invite this group in for a visit? Life in North Korea (Democratic People's Republic of Korea), however, is dramatically different. Christians there are imprisoned and even killed for having a Bible or simply being a Christian. They must meet and celebrate in secret. You can read more about the sacrifice and persecution of Christians in North Korea HERE. HERE ARE THE GOODIES FOR MY GIVEAWAY! Let your child learn the true story of Christmas as they practice their writing skills. This file contains fourteen different copywork pages with verses from the KJV Bible and one with a verse from a hymn. Each page is illustrated with black and white drawings and comes with both primary and straight lines. This 105 Page educational eBook focuses on the Story of the Birth of Christ as told in the KJV Bible. Included are fun exercises to take away any monotony that may arise (and often does) with copywork. Standard fonts have been used for general copywork, and Tracing Fonts have been used for the younger learner. Training lines and standard lines will be found throughout the book, which focuses on the entire passages of the Bible, but reinforces certain aspects of the birth which will already be familiar to your child when hearing the Sotry of the Birth of Christ. A Nativity Lapbook Craft is included in the book. Learn about the people of Korea through their literature, music, food, art, games, and language. The folktale recounted in this unit, The Bird with the Broken Leg, brings Korean clothing and food, as well as Korean vocabulary, to the forefront and help students produce their own picture book of the story. Cut-out characters and a story mat are included. This unit also helps children learn by making Traditional Knotted Pendants called maedups, Trigrams (symbols formed by a group of three lines), and a Yut game board. There's also a recipe for Cooking San Jok, words and music to a traditional song about the Korean national flower, called Mugunghwa, and a rules for playing Yut, and much more! A month-long unit study resource list on the country of Korea. In this comprehensive and multisensory 174 page unit study, your children will explore much more than Cinderella stories! This unit study takes your children on a tour of 6 distinct global cultures, looking at history, music, art, food, and scientific contributions. Children will explore the literary genre of fairy tales while comparing the six Cinderella stories across the cultures. While on their journey, children will also explore chromatics and the use of color by the French Impressionists, the use of natural resources across cultures, the active volcano region of Russia, the history of kites in China, the fermentation process in the popular Korean dish kimchi, Egyptian math and pyramid building, culinary arts, literary devices, public speaking, listening skills, and so much more! Nations studied: France, Micmac Nation, Russia, China, Egypt and Korea. Leave a comment telling me the most memorable Christmas present you have ever given or received, whether it was disappointing or spectacular. Don't forget to INCLUDE YOUR EMAIL ADDRESS. You can even leave it as "yourname [at] whatever [dot] com" to foil the spammers! I'll never forget the Christmas where my two other sisters, my brother and I put a cricket in a little box with a clear window. We wrapped it, wrote my sister Lele's name on it and placed it under the tree. We tried to suppress our laughter when Lele began to unwrap her special present. As soon as she spied the cricket, still alive and safely contained behind the clear window, she jumped up screaming and hollering and being a spaz. That was the ill-fated year that we "took a break from Christmas" as my parents sent us to our rooms! I'm not entering the giveaway, but wanted to let you know that I really enjoyed your post. And you forgot to mention my super cool, blue, holly hobby watch. What is leah holding in her lap? Love you! I have received a can opener from my dear husband a few times (back to back) for Christmas. Though I thought it was sweet a few times, when I looked under our tree to see a box that looked similar to ANOTHER can opener, I threw a fit. I told him I wanted him to get it and return it immediately. He tried to insist on me opening and I was fuming mad. I know it sounds terrible but come on! We as women work so hard and I just wanted him to give me a gift that said thanks for being such a great wife and mother. Well he talked me into opening it; telling me I would really need it for Christmas (I do a lot of cooking and I needed a new can opener lol)... so I did! To my shock and surprise it was my first Canon SLR I had asked for but was told we couldn't afford it. He still gives me a hard time about gifts. I CAN'T hide what I am thinking :-) He has given me many great gifts that I thought I wouldn't like. But my camera was a very wonderful gift! mgshortcake at gmail dot com. Also wanted to say I really enjoyed the video! Reindeer guy made me laugh too! ye haw! That is hilarious. You know my mom is so far removed from her Korean roots that I have not really heard at all how Koreans celebrate Christmas. I think that is strange. Thanks for the info. Oh boy, your poor sister! One of my most memorable Christmas gifts was a gift from my Dad when I was about 9 years old. Even by that age we knew that Mom was the main gift shopper of our family and something just from Dad was unusual. Thank you so much for your blog on Christmas, and for including North Korea. We often forget about it and the persecution the Christians face. Thanks for sharing all the info about Korea. This Christmas around the World has been eye-opening! Hmmm ... had lots of wonderful Christmas presents in the past, but there was one memorable disappointment that always makes me cringe. In late junior high or early high school, I desperately wanted an Epilady (a supposedly "pain-free" way to rid legs of unwanted hair). Money was tight and it was quite an extravagant purchase and I thought for sure I wouldn't get it, but I talked about it lots anyways. Well, of course, it was under the tree Christmas morning. I squealed with delight! Immediately opened it up and proceeded to try it out right there in the living room. Let me tell you, it was NOT pain-free! I used it for all of 5 seconds, if that, then promptly tossed it aside and never used it again. I cringe now at how thoughtless I was to my poor mom who worked so hard as a single mom to provide for me and my brother. Thank you for this Korean Christmas history. My mom, too, has lost much of her Korean roots and I did not know many of the 'facts' you posted. I think it will be a great idea to take time out of our school year to learn about Korea, especially the persecuted Koreans in North Korea. My most memorable Christmas gift was when I went into labor 4 days early 6 years ago. To have a Christmas Eve baby has been such a blessing and a tangible reminder of that Baby long ago. Awesome post! I loved learning about Korean Christmas, and thank you for the reminder that all people are not free to celebrate this Christmas. The best Christmas Gift any of us can receive is Jesus Christ. I am grateful for the freedom to celebrate Him this Christmas! Another memorable gift I received was when I was 12. My big brother made me a doll house! It was beautiful, and it was so special to me. This was so interesting and informative, thank you!! I LOVE the song, I like the guy wearing what looks like a Pittsburg hat (Big Yellow "P")- that was awesome. I loved receiving an original Nintendo back in the day. The most memorable gift I ever gave was horsemanship lessons to our foster kids. We gave them all sorts of clues and finally ended with cowboy boots. They loved it! My most memorable gift was when I was 6 years old. My great Aunt gave me a really hideous yellow and orange plastic toy car, about 8 inches long. I was appalled and immediately dropped it saying, "I don't play with stuff like that!" This is why it's memorable: I received the most painful lecture of my childhood about gratefulness. From that point on I unwrapped all my gifts before Christmas and wrapped them back up again so that I could never ever be surprised by a bad gift. I would know that it stunk and have a month to prepare myself to look pleased and think up a compliment on it. "Oh, what a marvelous sweater! It has every color in it imaginable. I can wear that with any color pants that I want!" I remember my first real piece of jewelry. I was in 3rd grade and was very excited to have a real ring like my mom. It was gold with sapphires. I was very happy that year. Thank you so much for all this great information! One of my best secular presents I received was 5 years ago, my husband got a Christmas bonus - unexpected - and surprised me with an ipod which I had been dreaming of for years. As a child a remember getting the stereo I always wanted when I was a teenager. Thank you for the post. And thank you for including N Korea, we must not forget to pray for those who are persecuted for the Lord. My best present?... hard to say. I think it would have to be a game for the WII. It turns out we all love it. My most memorable was a huge barbie house that I received...because I didn't even see it....I was too enamored with the Baby Alive I had received. My step-dad has never let me forget how many screws he had to use to put it together. I just loved this post. In just the past few days I decided next year to take the month of December off from homeschooling and do a study on Christmas. These books would be wonderful. Least favorite gift a bathrobe. In fact twice now. 2 different givers, 2 different years but both very bulky and not me! If you have a recipe for kimchi I would love it. I love kimchi but the restaurant that used to serve it closed and I really miss it. It has been interesting to learn about the different traditions. Thank you for this one. There is only one year that I remember that we had a big Christmas (poor and a very large family). That year us older kids got a bicycle and it lasted through all 10 of us kids. Thank you for the Korean Christmas facts. I never thought of how terribly different North and South Korea are. A present I gave to my son at Christmas years ago still stays in my mind. As a struggling single mom I was proud to be able to buy him a little bike for Christmas but could not afford the extra $10.00 to have it assembled. So all night long on Christmas Eve I desperately tried to put it together with little success. I felt so bad in the morning and promised we would ask a friend to help us with it. He asked me to let him try and in no time he had put it together! Needless to say after that I always let him assemble his own toys. And now as an adult he is still as handy as ever, and I have him come over to put things together for ME! Merry Christmas to all, whatever your traditions! The Korean kids with their red and green capes make me smile. That is too cute! And I really like the BLUE santa. I can see an Elvis impersonator dressed like that singing Blue Christmas. It makes me heartbroken to know people are persecuted for believing in Jesus. I love your special memories of childhood. Truly special. My cousin Curt made me a green pillow in home ec. It was one of my favorite pictures ever. What a cool post! I really didn't know that Christmas is National holiday in S. Korea! The most memorable is not a gift that I received, but rather my sister. My grandmother, who is known for the wacky gifts she has given, gave my sister an accordian one year! (it was when my sister was 15 so it was so NOT COOL for her) Our family laughs about that every year now! This will be our 2nd year now to have Christmas without my grandma :-( but you can bet we will spend time remembering and laughing about the wacky gifts she gave (and wishing we had just one more year of wacky gifts with her). Love reading your post on Christmas in Korea. I remember getting a bicycle for Christmas but my sister and I ruin it as we got up in the middle of the night and discovered the bikes hidden in the kitchen. My mother was so mad she put the bikes in the garage and threaten to return them to the store since we peeked. I've had several memorable presents. I remember one year getting a new red sled, just like I wanted. I was so excited. Last year my husband gave me a vacuum, my dream vacuum, and while I was excited I was kind of upset that he spent all that money on me when I would have loved to been able to spend a little of it on him. This year I told him, if he gets a bonus its "mine" just in case I want it. I actually received this Christmas gift after the fact but it was and still is so precious to me. Back when personal video cameras were just starting to come out, my hubby and I purchased one for like $900 as our Christmas gift to each other. We took lots of video that Christmas of family members opening gifts, etc. Two months later my Dad passed away. Later, when we finally were able to get the video on VHS tapes to watch it, there was the most amazing clip of my Dad smiling and waving at us. It almost looked like he was telling us goodbye. My sister and brother and I have watched it many times and always feel like that was one of our best Christmases ever when we were all together. The gift that stands out most to me wasn't to me at all but from my sister to my then 2 year old daughter. It was called Be Bim Bap by Sue Young Park I believe. My daughter loves the book so much that for 2 years I could get her to eat any rice dish and all her veggies by telling her it was be bim bap. She is 4 and she still chants the lines from the book as I cook her dinner. I love that she loves Korean food and embraces that part of her culture even if she is only 1/4 Korean. Last year, my husband purchased our 16 year old a laptop on black Friday. I let her have it early, but told her she would have to give it back to me to wrap up for Christmas. Meanwhile, I designed a personalized skin for her laptop, and put it on the computer when she returned it to me (to be wrapped) on Christmas Eve. I had told her that she better act surprised when she opened up her computer on Christmas morning... so she was in full-on actress mode while she was opening it. Then she saw the skin. My daughter - the same daughter who never gets excited about gifts - who had simply smiled and said "Thank You" when we gave her a car for her birthday - collapsed into a pool of blubbering tears at the sight of her laptop skin!! A $20 item! And I caught it on video. She must have cried for 15 minutes! It is a moment I will never forget. PS. Merry Christmas to you and your family! I loved reading this post- my dad was stationed in Taegu, Korea when we were little and I have many good memories of life on the military base there. One memorable Christmas was when we received an Emerson tape recorder and had the most fun taping our voices and making up radio shows and commercials. The most memorable present I received was luggage. I know that sound really dull, but I needed to start traveling for my son to get medical care on a regular basis, and I had never done much traveling and didn't have any luggage. My mom got me a really nice set, and I wore it out in 4 years I used them so much! Thanks for sharing this great wealth of information with us. We are having so much fun with this study! Thanks! I received a Cat one Christmas when I was about 8 years old and his name was Garfield because he was yellow and at the time I really loved Garfield. Thank you for sharing about Christmas in Korea. We love the blue Santa! The most memorable gift is hard to say. There were many surprises both good (a guinea pig!) and bad (no bike). I had my third child three days after Christmas so he could be considered a late gift and if so, that would be a strong candidate. I think, though that I would have to say that Christmas the best gift was family. Before that Christmas my father had a stroke and they thought he was going to die or be totally incapacitated. He pulled through by the grace and healing power of God. That was the last Christmas that all of my family was able to gather together and be a family. Since then, several have died and others live so far away, we are never together as a family. Even when I am able to go home, my husband is not able to join us because of his work schedule. He can never get enough time off. I treasure that time we had as one big family together, dysfunctional as ever and loving it! Thank you so much for the information. The video was wonderful! I would invite them into my house! I have two very special gifts, one from when I was a child and one from when I was a new mom. The first is a handmade doll cradle, made by my grandfather. I still have it to this day and is even more special as this is the first Christmas without him. He passed away on my birthday this year. The other gift came a bit early. My husband and I welcomed our first daughter on December 4th, 1993. When he brought us home from the hospital, in the living room was the antique rocking chair I had wanted wrapped with a big red bow. Loved learning about Christmas in Korea. 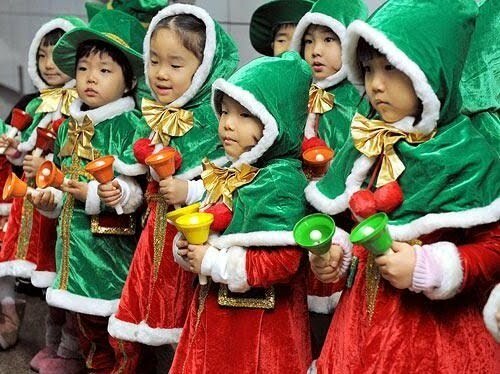 Love the photo of Korean Santa in blue and yellow and the pther photo of the children in green and red holding bells. Also loved your family by the tree photo. 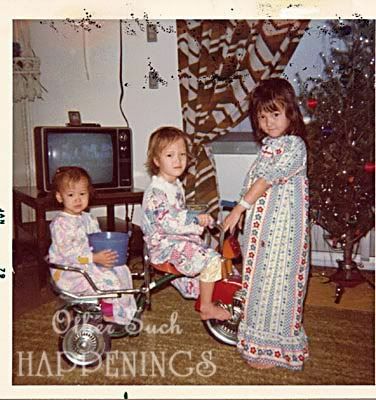 Think my sis and I had similar jammies to what you are sporting in your photo, too. As far as a favorite, most memorable Christmas present, it would have to be the Meg, a Madame Alexander doll I received from my aunt and uncle. The doll is Meg from Little Women. she sports a lavender and white dress and a white hat. I just loved this doll as a child. I looked forward to getting a Madame Alexander doll from them every Christmas. Great giveaway. The Cinderella resource would be very interesting to win. My most memorable present was from my Mom's boyfriend at the time and he wanted to embarrass me. Needless to say he did, and I can almost always top people talking about their worst Christmas present. Getting someone else's old holey underwear in front of his whole family was not fun. Honestly the best Christmas Present I have given was to my friends kids whose Dad disappeared Christmas Eve and woke Christmas morning with nothing. They thought Santa forgot about them and I couldn't let that happen. I know the stores weren't open so I went through my sons things and found things he didn't use anymore. I wrapped them and made a batch of brownies for them and took them over to them. I told them that Santa left these in my car by mistake. The faces lit up and they enjoyed everything they got. I think for me that was the best gift I have ever given and to me the best gift received was seeing their faces light up. I'm so glad I found your blog, the RS give-away, and this post. I am tutoring two Korean children, and our families have become such good friends. I will have to greet them with Sun Tan Chuk Ha when I see them tomorrow. Most memorable Christmas present...My parents gave me an Atari when I was 8 with Donkey Kong and Frogger! My best gift by far was my son. He was born at 6:21am on Christmas morning.